The Economist of January 25, 2014, carried an article by Shannon van Sant -- Malaria eradication: cure all? that analyzes the fascinating and controversial effort by Chinese researchers, a Chinese drug company, and the Government of the Comoros to eradicate malaria across their three islands, and 700,000 people, using several rounds of an malaria treatment: artemisinin, developed from a Chinese herb, for the entire population, one by one. The questions she raises are good ones. Being myself in the middle of an intensive, months-long IRB (Institutional Review Board) process at Johns Hopkins to allow me to move forward on grant-funded research on Chinese agricultural investment, I can say that (no surprise) it appears that China lags behind in imposing rigorous safeguards for ethical research practice. are side-effects being monitored in a systematic way? are people who participate doing so with adequately informed consent? how commercial is the motivation, given the involvement of China's Ministry of Commerce and the Chinese drug company? A lot of reporting went into this story. It is very well-balanced and insightful, and pulls in informed voices from different sides of the debate. Other islands (Mauritius, for example) eradicated malaria by compulsory spraying of DDT inside people's houses. This option is no longer available and obviously contained its own risks. I'm not a public health expert -- but I'm interested in comments from readers who are: what is your take on this experiment? What is the WHO position on it? Chinese Aid to the DRC is not new, but the study finds that, contrary to the general perception amongst the Western and Congolese public, it is small in terms of volume and scope (only few individual projects in the sectors of road building, health, school building). In contrast, Belgian Aid to the DRC is sizeable, consisting of rather complex projects in the sectors of road infrastructure, agriculture and education. Belgian projects generally achieve a strong local involvement because of the participatory nature of the projects and the way they are institutionalised. Chinese projects generate a similar level of involvement by their focus on visible output-oriented projects that are often of direct use to the local population. Chinese projects that are part of commercial contracts, are often wrongly perceived as Aid by the local population. Chinese Aid lacks the attention for capacity building and institutional integration (of Belgian aid), but still achieves similar levels of sustainability as the Belgian projects, because it focuses mainly on economical infrastructure and tends to follow up the projects for long periods. 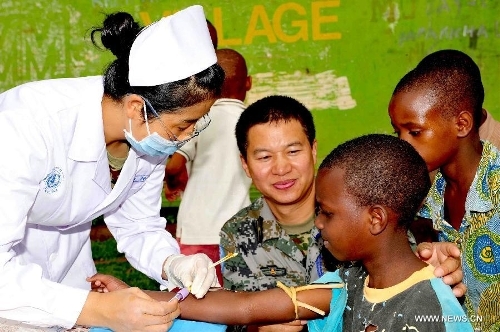 Although medical cooperation will be continued as a part of China’s diplomacy, China is now actively exploring how it can be fitted into its new cooperation model, featuring the mutual benefit component. This means that Chinese enterprises will be stimulated to enter the recipient country’s market, as a first step in the outward-looking strategy of the Chinese medical industry. The Paul H. Nitze School of Advanced International Studies (SAIS) SAIS China Africa Research Initiative (SAIS-CARI) announces a call for papers for a Conference on China, Africa, and Agricultural Investment, May 16 and 17, 2014. The SAIS China Africa Research Initiative (SAIS-CARI) will hold an inaugural public conference on May 16, 2014 and private research workshop on May 17, 2014, in Washington, DC at Johns Hopkins University’s School of Advanced International Studies (SAIS). The theme will be Researching China’s Agricultural Investment in Africa: ‘Land Grabs’ or ‘Friendship Farms’? The goal will be a deeper, comparative understanding of the motives and experiences of Chinese investors; the network of relationships: investors, governments in China (national and provincial) and in Africa, intermediaries and brokers; and the impact of their investments. We are pleased to announce a Call for Papers for this conference and workshop and a Small Grant competition, with funding from the Smith Richardson Foundation. Proposals can be submitted at any time but are due by February 14, 2014. Studies of the business model behind China’s agro-technology demonstration centers. The list is for suggestion only; other topics are also welcome. All papers must be based on fieldwork and focus on case studies of specific investments or projects. Applicants are welcome to discuss their proposed research with the conference organizers before making a proposal. Comparisons between Chinese and other investors would be particularly welcome, or comparisons between Chinese agricultural investments in Africa and in other regions (including China). Prospective authors should submit a two page proposal to SAIS-CARI@jhu.edu by February 14, 2014. Proposals should include a 300 word abstract of the paper, a brief description of the research project and methodology, and a short biography of the author. A limited amount of travel support will be available for selected researchers to attend the conference. Authors should indicate whether they need travel support in order to participate. In addition, approximately five small grants of $3000 will be awarded for researchers (including advanced masters and Ph.D. students) to (a) conduct an initial, scoping visit to a Chinese agricultural investment project in Africa, or (b) pay a return visit to such a project in order to update research carried out previously. Visits should be concluded prior to the conference, although exceptions may be made. Applicants should apply separately for the small grant, providing a one page statement of the specific purpose for which it will be used, and any prior research conducted on this topic. Researchers will be expected to report their findings at the conference. Papers can be in English, French, Portuguese or Chinese, but applications and presentations must be made in English. Many Nigerians have the impression that the Chinese are incredibly corrupt. I would make a slight modification: the Chinese in Nigeria are incredibly corrupt, because the Nigerians in Nigeria are incredibly corrupt. What I mean is this: on their own, the Chinese are neither devils nor angels. They simply amplify the characteristics of the existing business environment in Nigeria. For now, this means that they aid and abet corrupt practices, because that is what individual Nigerians demand as the price to play in the Nigerian market. Unlike Western businesses or development institutions, the Chinese generally do not speak English fluently, so they cannot read the laws for themselves. Moreover, they are here to make money, not to take a stand for law and order. All of this means that the Chinese have the effect of reinforcing the status quo, and today, that status quo is the corrupt diversion of public monies into private hands. As this textile importation example shows, for Nigeria’s business environment to improve, it will require not only passing thoughtful legislation, but also honoring those laws in everyday practice. But the power is in Nigeria’s hands. The Chinese will go to great lengths to do business in Nigeria; today, they brave murky laws, shady characters, and underhanded practices to play in this market. Imagine what they would do if Nigeria cleaned up its act.